The most basic HTML5.0 - Web SQL Database Tutorial. 1. Set DB's Name and Size. DB's name is WebLogger8 and the size is 512K bytes. 2. Create 2 DB Table. One with Index and the other with Data. 3. Add Data Block to DB Table. Append the data table. You must write to DB after you have received entire Data Block. If you try to write data values every time you receive it, you will lose a lot of data. The confusing thing is that you receive correct number of data; however, you don't see the actual values anywhere. We don't define data type for each column. This makes things simpler and confusing at the same time. When you actually write to DB the type gets defined. I am assuming that block becomes String, seq becomes Number, and data becomes String. block and timeStamp are both String type. Inside one db.transaction, do not append DB twice. Theoretically this is not a problem; however, if you continue to use that statement it causes error so let's avoid it. // date. There are many others. // wrote. Thus we index it inside block. When you try to change the name of DB, close all Chrome windows and re-open it. Otherwise new DB Table does not get created. If HTML file is not in the same Folder path, close all Chrome windows and re-open it. If you don't do this WebSocket doesn't get connected. 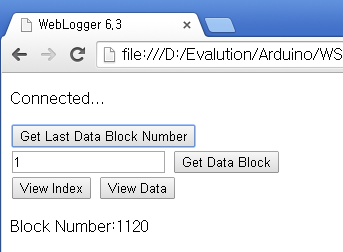 Get the last SD logged Block Number from Arduino. 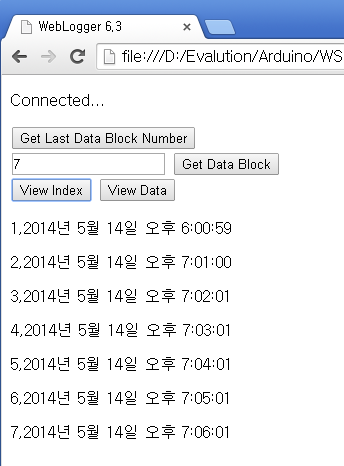 Click the [Get Last Data Block Number] button. 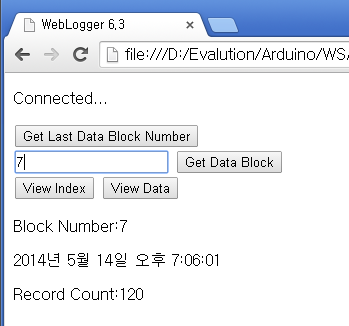 Enter the Block Number and Upload that certain Data Block from Arduino SD. Enter the Block Number and click [Get Data Block] button. If you upload, it gets inserted into both Index table and Log table. It is displayed in Block, Time Stamp order. Enter Data Block number to check Data Table. Enter Block Number and click [View Data] button. You will be able to see 120 values from that Block. Only the data will be shown. The link to the code is posted in the end.